The daughter of a Cuban exile, Hortensia Soriano remembers a childhood shaped by her relationship with her father and his art. 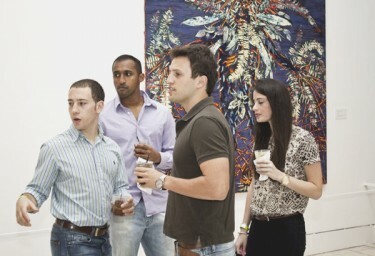 On Thursday, she presented her first tour of her father’s exhibit at the Lowe Art Museum at LoweDown Happy Hour. On Jan. 29, the Lowe Art Museum introduced a new retrospective exhibition on the work of Cuban exile Rafael Soriano titled Rafael Soriano: Other Worlds Within. “I feel very honored that the Lowe Art Museum had my father’s work on their walls,” Hortensia Soriano said. Soriano’s exhibition at the Lowe is a collection of 75 paintings spanning over six decades, including his last painting “Planeta.” Upon completion of “Planeta” in 2000, he retired his easel and put his paintbrush down forever. He said that any painting he was going to paint, he already had. “This exhibition is a testimony not only of my work but of the trajectory of my life and how it has manifested in my paintings,” Soriano said. Soriano, 90, was born in Cidras, Cuba and began experimenting with various geometric abstraction art styles in the 40s. Soriano became unpopular with the government of Fidel Castro and in 1962, he left Cuba for Miami with his daughter and wife. Following his exile from Cuba, Soriano was mentally and emotionally unable to paint and initially reluctant to identifying with what it meant to be Cuban-American. As a child Hortensia Soriano was surrounded by her father’s art and the love of her parents, who have been married for 58 years. Like many exiles at the time, she said her parents were always eager to return to Cuba. Then, one day Soriano had a dream. After this experience Soriano began to paint again, but his style had completely changed. His first painting after relocating to Miami, “Ventana Cósmica” (1966), demonstrated a developing stage in the evolution of his style, referred to as oneiric luminism, a masterful combination of shape, space, and light that seems to surpass depth and dimensions. According to Brian Dursum, director and chief curator at the Lowe, the museum has a long tradition of featuring older generations of artists like Soriano. Soriano’s collection will be featured at the Lowe until March 27. Chloe Herring may be contacted at cherring@themiamihurricane.com.